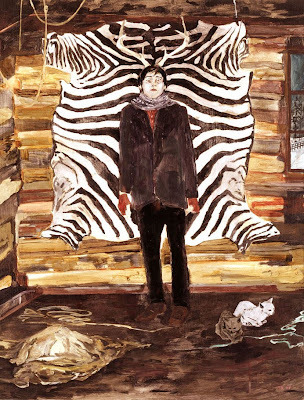 I spent a good part of Sunday sitting on my zebra skin rug, completely bundled, yet frozen to the bone, trying to paint and conceptualize a series of images that would eventually fold into a log cabin. Half way to completion, I became horrified with the realization that the end product would be a whopping 1.5 inches high - and ultimately, a failure. Hernan Bas must have had a blurry vision of this about five years back. I've added him and a few other completely on-the-radar artists to my Artists to Adore sidebar. Doesn't seem quite right: while NY was suffering in the cold--So. Calif. was enduring close to 100* heat!